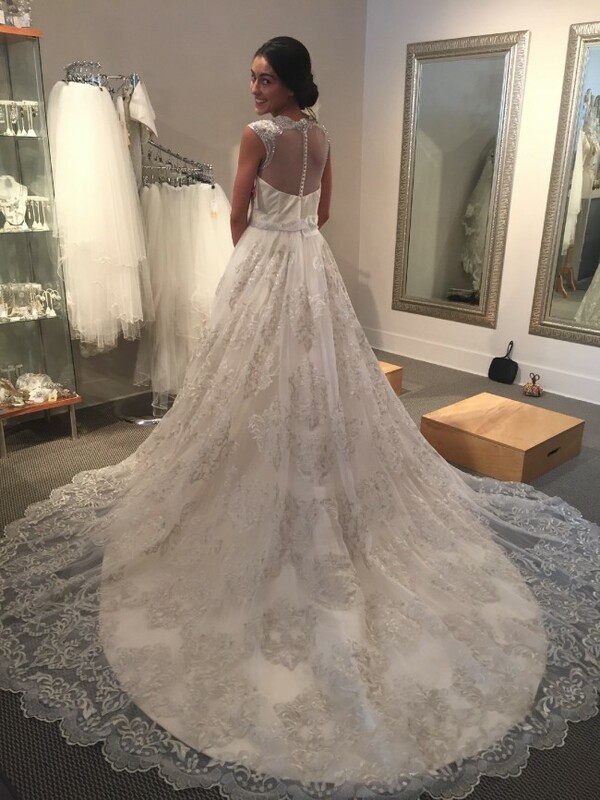 I fell in love with two wedding dresses, something I never expected! This beautiful Cristiano Lucci gown was one of them. When I put this dress on, I felt like a QUEEN! I ended up wearing the second dress which was actually a replica of my Grandmother's wedding dress. I wish I could have worn both!! This beautiful gown has a sheer illusion neckline with exquisite beading, full A-Line skirt accented with a dramatic embroidery pattern. This dress belongs on the cover of a bridal magazine with the cliffs of Italy in the background. It's even more stunning in person. The sparkling beaded belt still has the protective cover in tact to help keep the dress preserved. This dress has never been outside or altered! The only changes made to the original design was adding 12 inches to the train for a more royal and dramatic entrance. 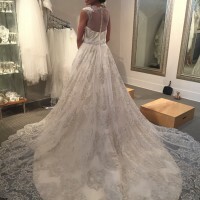 After the added cathedral train, I am offering this dress at a $1,300 discount! This was part of my original order. If you are looking to feel like a queen on your wedding day, this is the dress for you! The beautiful embroidered lace matches perfectly with an ivory cathedral veil. I would be happy to show more pictures upon request. Praying to offer this dream dress to a beautiful bride below listed retail price and without the additional cost for the added length. For a Brand New dress, you can't beat that! My rough measurements are 33 inch bust, 26 inch waist and 34 inch hip. I am 5'6, size 4 and around 125-130 pounds. If you have any questions I would be MORE then happy to answer them!! Hoping to make a bride's dream come true. This dress is too beautiful to never be worn!